JAKARTA, Indonesia (CNN) -- A suspected terrorist linked to several Indonesian bombings in the past decade was killed in a protracted firefight Saturday in the Central Java town of Temanggung, two law enforcement sources told CNN. A poster in Malang, East Java, Indonesia, has under "dicari," or"wanted," Noordin Top. Another raid by police Saturday averted a planned assassination attempt on Indonesian President Susilo Bambang Yudhoyono, authorities said. Noordin M. Top was killed during a raid by the anti-terrorism unit Detachment 88 that began Friday and lasted 18 hours into Saturday, said a police source and a security analyst with close ties to the police. Official confirmation of Top's identity will come next week after DNA results, said Indonesia's National Police Chief, Bambang Hendarso. Indonesia's anti-terrorism forces had been hunting Top for the past six years. He is also the main suspect in last month's twin hotel bombings in Jakarta. It was the first major terrorist attack in Indonesia in more than three years. Top is reportedly an officer, recruiter, bomb-maker and trainer for a splinter group of the militant organization Jemaah Islamiyah, which has ties to al Qaeda. He allegedly was involved in a previous attack on the Marriott in Jakarta in August 2003, as well as attacks on a Bali nightclub in 2002 and the Australian embassy in Jakarta in 2004, according to the FBI. In February 2006, the FBI added Top to its list of 10 suspected terrorists who have not been charged in the United States, and are wanted only for questioning. The ramifications of Top's death were not immediately clear. "This is a huge advance in Indonesia's fight against terror," said Sidney Jones, a senior Asia adviser for the International Crisis Group, a global nonpartisan advisory organization. "But this is not the end of it because we still don't know the extent of the network and the funding source of Noordin's network." Three to four people were believed to be holed up in the house in Temanggung, police said. Security forces had launched a raid on the house after two people believed to be nephews of its owner were arrested earlier in the day, according to the official Antara News Agency. "Police officers entered the house and fired profusely inside the house while other policemen surrounded the house and opened its windows by force," Antara said. After the gunfire ended, local television showed police with their helmets off, shaking hands and carrying caskets into the house, suggesting that those inside the house had been killed or captured. Also on Saturday, in a house on the outskirts of Jakarta, Indonesian police killed two militants believed to be connected with a 2004 bombing and found a cache of explosives in an early morning raid, the national police chief said. Hendarso said that police found about 100 kg (220 lbs) of explosives along with bomb-making materials and a truck, which they did not immediately open for fear it might have been rigged to explode. Those bomb-making materials were going to be used in an attack on the president, Hendarso said. 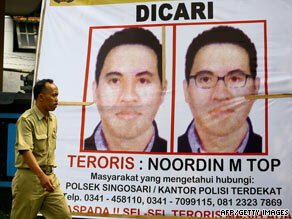 The two militants killed are believed to be connected with the 2004 bombing of the Australian embassy in Jakarta in which 16 people were killed and more than 200 were wounded, Hendarso said. Also, a man identified as Suryana, who uses the aliases Yayan and Gepeng, was arrested in north Jakarta on suspicion of terrorism charges, said Nanan Soekarna, police inspector general. Soekarna could not say whether Suryana was connected with last month's hotel bombings or other incidents.